Geese, ducks and swans that spend winter in wetlands of Northern Europe are changing their migration patterns as temperatures rise, say scientists. Researchers in Finland found some waterfowl delayed migrations by up to a month compared with 30 years ago. The Wildfowl and Wetlands Trust (WWT) says that numbers of some very familiar species are decreasing in the UK, as many birds do not fly as far. The study is published in the Journal of Ornithology. Lead researcher Aleksi Lehikoinen from the University of Helsinki examined three decades' worth of data from Hanko Bird Observatory in southern Finland. Since 1979, volunteers there have been undertaking daily bird counts, to build up a "migration census". This revealed which species were flying south from Finland and when. The three-decade census revealed that "some species had been delaying their migration dates by as much as one month", Dr Lehikoinen told BBC Nature. Six species out of the 15 they counted set off significantly later; these included some traditional UK winter visitors, such as the greylag goose and the tufted duck. Dr Lehikoinen and his colleagues say this shows just how rapidly waterfowl respond to the changing climate. "One thing that's been found in other studies as well as ours is the temperature of the water has been increasing even more rapidly than the air temperature," the scientist said. "This means there's more food available for these species [further north]." Shrinking flocks For the UK, there may be far fewer of our annual avian visitors in evidence in the winter. Dr Geoff Hilton, head of species research for the WWT explained: "In this country, we're at the end of the flyway for birds coming down from Scandinavia, Russia and Siberia." "We're almost the last stop, so some species aren't coming at all. They'll just stay further up the flyway." Dr Hilton, who was not involved in this study, said it provided a snapshot that chimed with changes he and his colleagues had witnessed at the trust's largest wetlands reserve in Slimbridge, Gloucestershire. He used the example of white-fronted geese, which have declined by about 75% in the UK in the last decade alone. 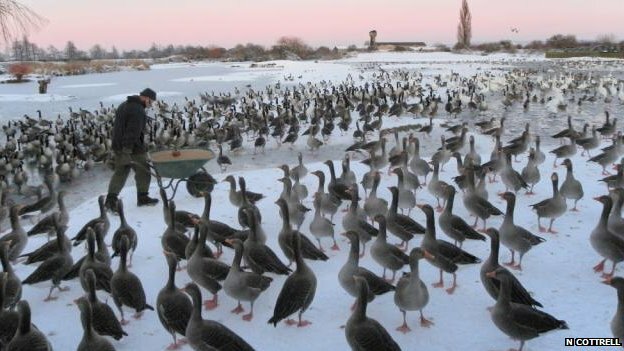 "At Slimbridge 30 years ago, we typically got 6,000 birds in the winter peak; now it's typically 500," said Dr Hilton. These shrinking flocks, Dr Hilton explained, could have knock-on effects on the wetland habitat. "These are quite big changes ecologically," he told BBC Nature. "If you suddenly lose thousands of geese from a wetland, there are bound to be big effects on that wetland." More generally, Dr Hilton said, "our sense of the changing seasons is moving underneath our feet." "Nature's moving away from us." Dr Richard Gregory, head of species monitoring and research at the RSPB, added that the study supported "the growing weight of evidence showing that wildlife appears to be responding to climate change". The team in Finland now hope to carry out a more detailed study of the populations of winter waterfowl across northern Europe, in order to find out which species' ranges have shifted northwards and which species are declining globally.